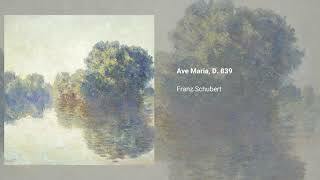 Ave Maria is a piece for voice and piano composed by Schubert in 1825. Originally written as part of his Op. 52, a setting of seven song from Walter Scott's epic poem The Lady of the Lake (loosely translated into German), the piece was called Ellens Gesang III, Op. 52, No. 6 (catalogued as D. 839). The fact that the opening lyrics are Ave Maria may have led Schubert to revise the text as a religious song, and in that form it became widely known. Nowadays it is commonly performed at wedding ceremonies.